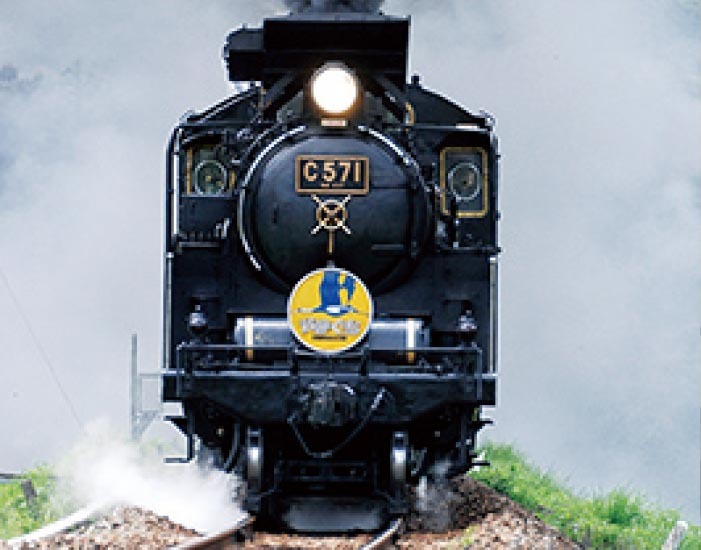 ･A convenient loop trip through the Iwami region starts by taking a train from Shin-Yamaguchi to Tsuwano. ･Travel up the San-in coast at your leisure and cross over the Chugoku mountain range back to Okayama. 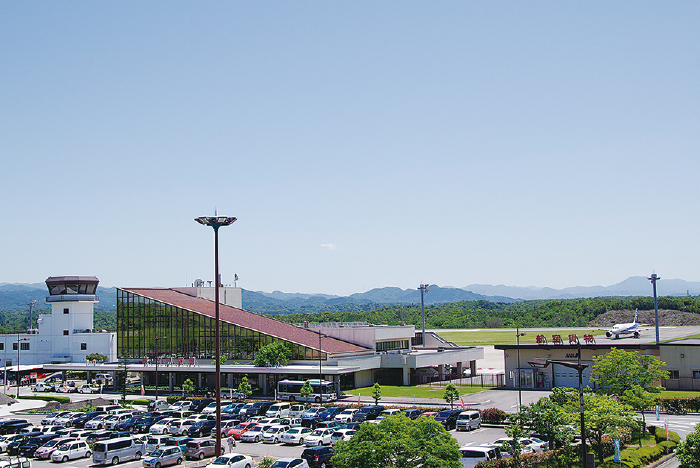 ･From here, you can board the Shinkansen back to any major city. This loop can be done in the reverse order as well. 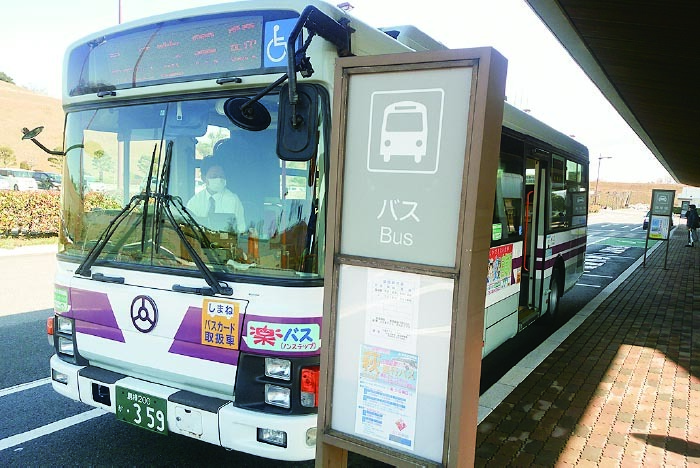 ･You can also take an expressway bus from Hiroshima to Hamada. 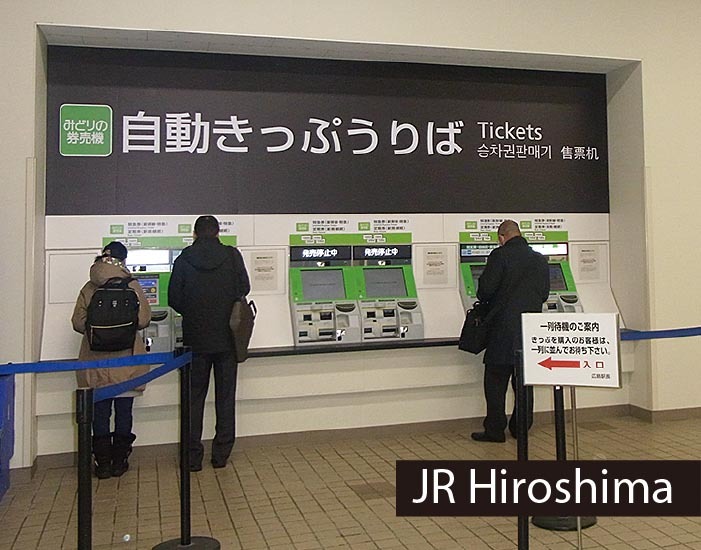 ･ All trains in this pamphlet are JR San-in Line unless indicated. ･ Trains on JR San-in Line run about once an hour in each direction. ･ Trains on JR Sanko Line depart ve times a day. 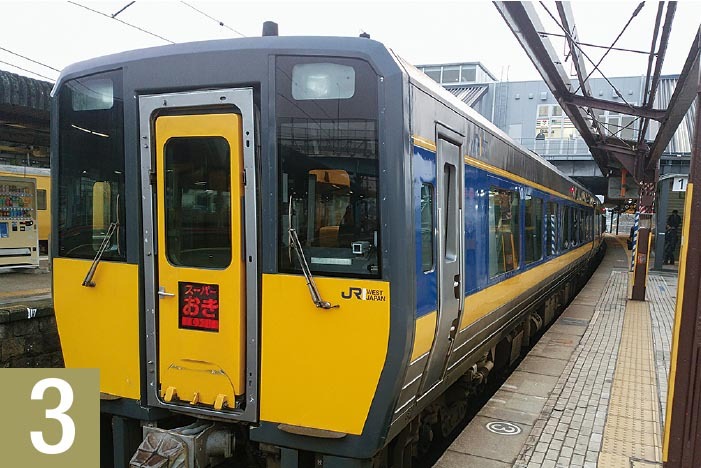 Iwami Trains please be aware that public transport may not be that frequent and plan accordingly. Purchasea Shinkansen and Yamaguchi line ticket together at Hiroshima or Hakata Station. 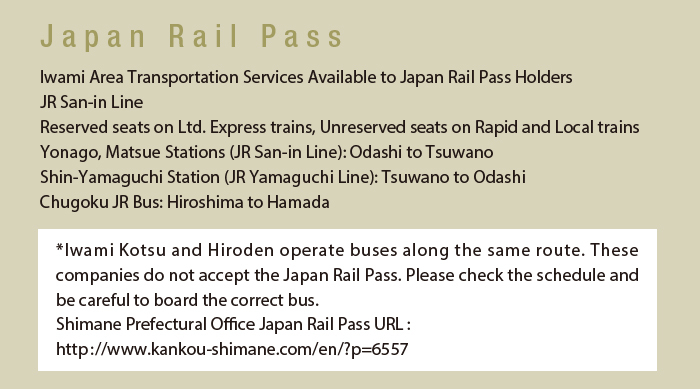 (If you have a Japan Rail Pass, no additional purchase is required.) Also,available from English-language vending machines. “ The Lady ”, runs through unspoiled countryside between JR Shin-Yamaguchi and Tsuwano Stations. It operates from March to early November and during the New Year holidays. Descend from the Shinkansen platform to the ticket gate. 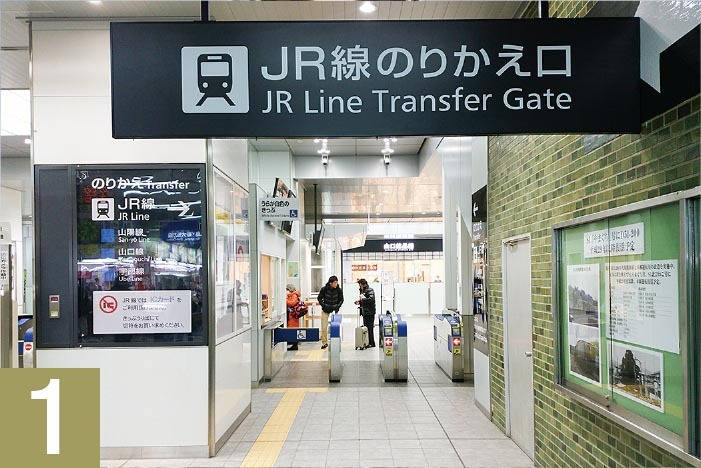 Pass through the JR Line Transfer gate (see photo) and go straight. If you have extra time between your transfer, you can go through the regular ticket gate instead and purchase uirou (a famous Yamaguchi confection) at the shop in front of the waiting room. Limited Express and SL Yamaguchi trains bound for Tsuwano Station depart from Track 1. You can descend to Track 1 at the end of the hallway (see photo). The nonreserved seat car of the Limited Express Super Oki train can be boarded on the left while the reserved seat car boards on the right (when facing the track). No food or drink is sold on the train so please make any necessary purchases before boarding. 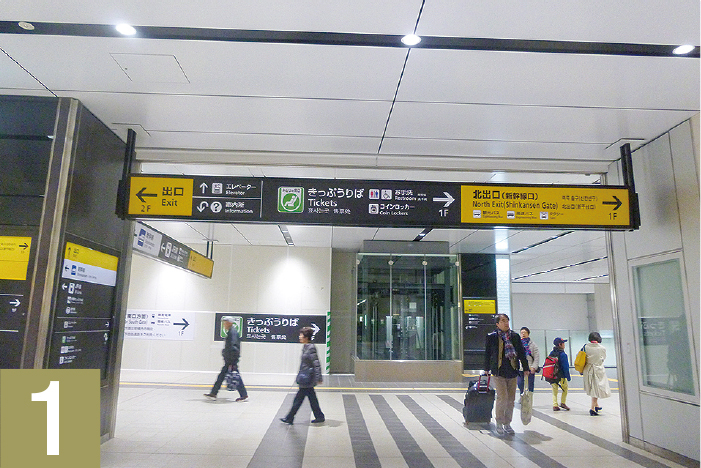 From the Shinkansen platform, descend and exit the main ticket gate (one location). Take the elevator directly in front of you or turn right and descend to the first floor using the escalator. 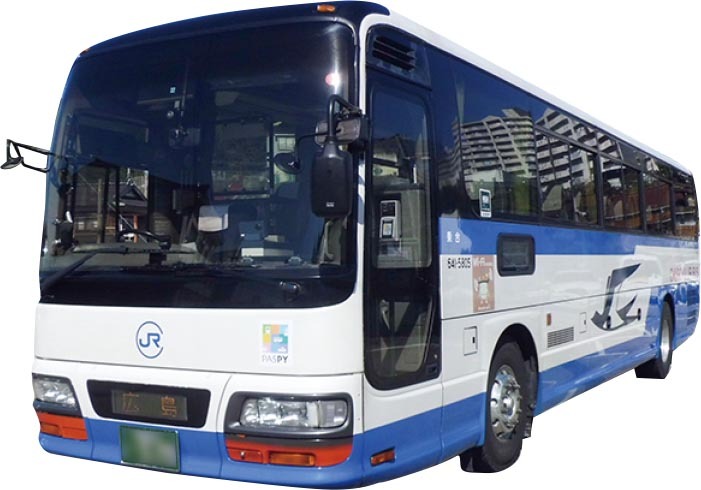 Japan Rail Pass holders may also ride any bus between Hiroshima and Hamada operated by Chugoku JR .
*Buses operated by Iwami Kotsu and Hiroden also run between Hiroshima and Hamada so please check the schedule and be careful to board the correct bus. 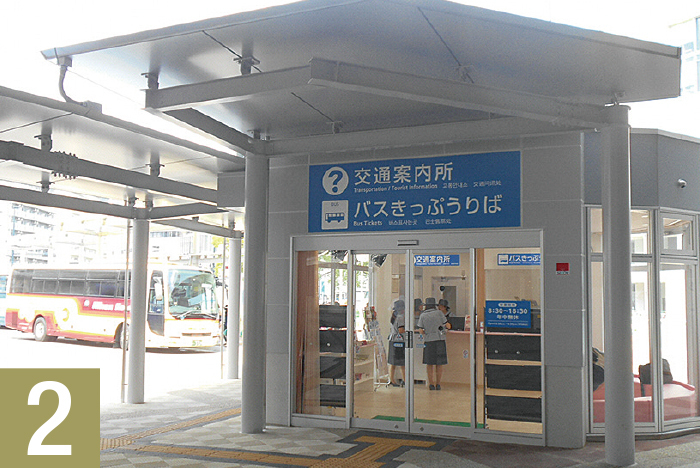 The luggage hold of the bus will not be opened at each stop en route to Hamada. 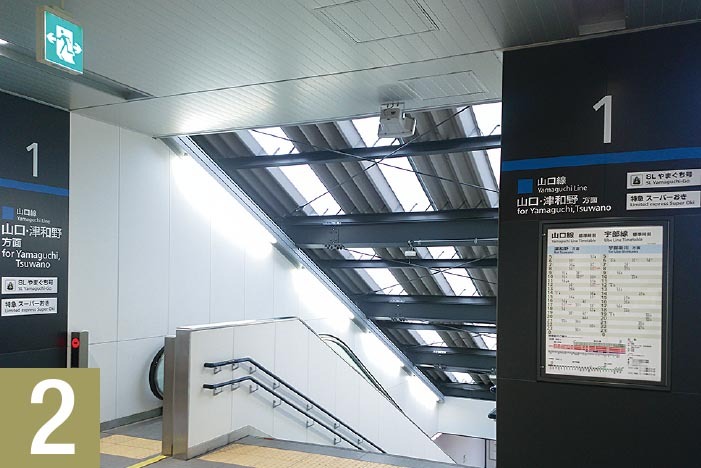 If you place your baggage in the luggage hold and are planning to get off at a stop before Hamada, please ask the driver to open the luggage hold at your stop. Conveniently located in Masuda City. 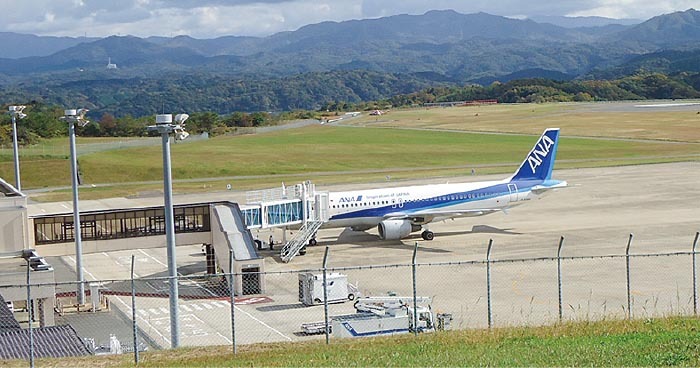 ANA offers twice-daily flights to Haneda, Tokyo. *Hours are subject to change according to the current flight schedule. 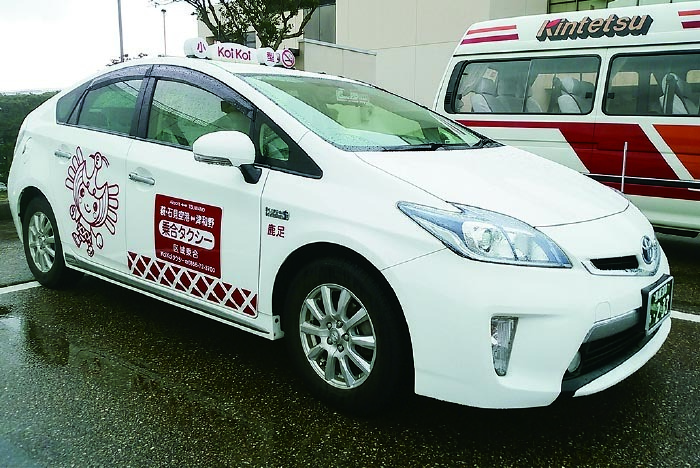 The shared taxi driver waits near the exit of the arrival terminal. *Please make a reservation for the shared taxi by 9pm the day before your arrival. If you have not made a reservation, seats in the taxi may still be available when you arrive. Please ask the driver about availability. 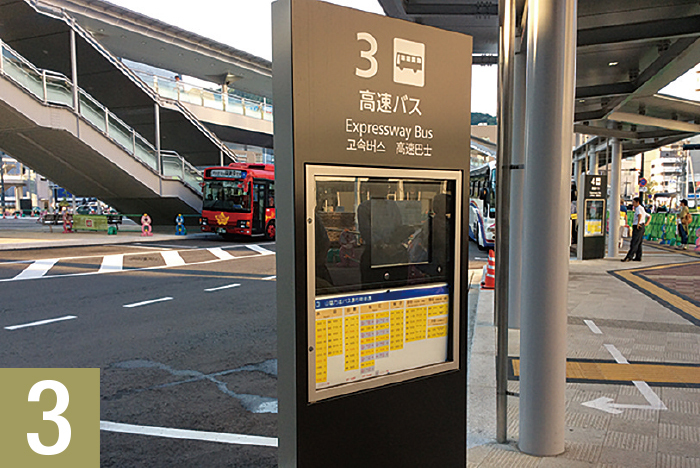 Local buses stop outside the arrival terminal and will take you to Masuda Station. Buses run based on the ight schedule.